Family, friends and members of the law enforcement community mourn the loss of a true hero and come together to support the family he left behind. Sgt. Danial Baker of the Dickson County Sheriff’s Office was killed in the line of duty while responding to a call of a suspicious vehicle. It was a senseless act of evil against a man that dedicated his life to serving his country and helping others in his community. The death of Daniel Baker will be felt most at home with his wife Lisa and daughter Meredith. Lisa faces the challenges of losing her best friend, raising their daughter on her own, and making sure Meredith knows the hero, that is her father. Friends and members of the law enforcement community have rallied together to raise money to support Daniel Baker’s wife and daughter through this extremely difficult time. The 100 Club of Nashville is accepting charitable donations to help the Baker family. The Homes for Heroes Foundation is grateful for the opportunity to support the community efforts with a $5,000 grant. 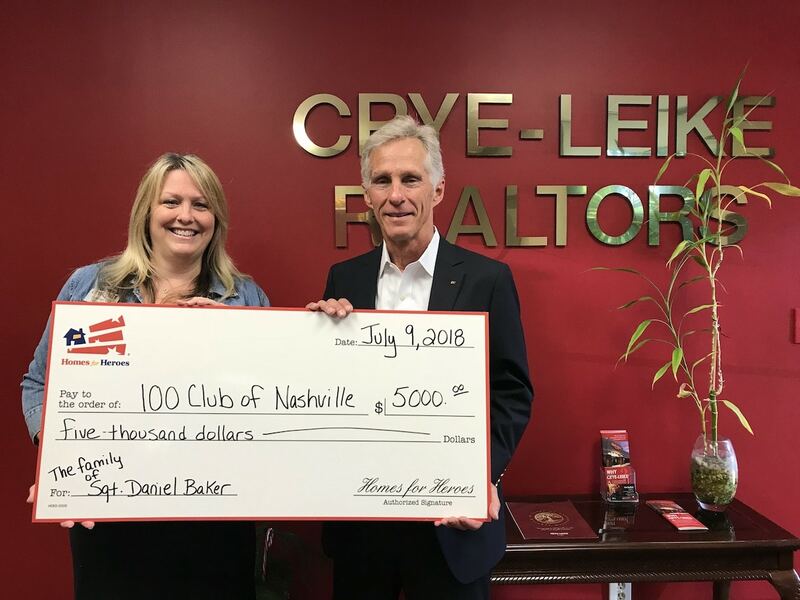 On July 9th, 2018, Homes for Heroes real estate specialist, Barbara Bell, presented the 100 Club of Nashville with a $5,000 grant on behalf of the Homes for Heroes Foundation. This grant will go towards relieving the Baker family from some of the financial stress they face, and hopefully allow them to focus on healing.